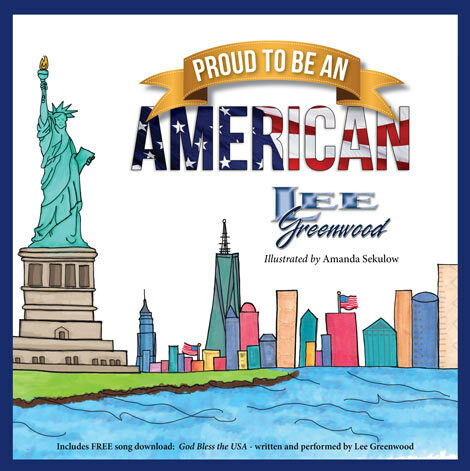 NASHVILLE, Tenn. (May 27, 2015) – Lee Greenwood is taking the Amazon charts by leaps and bounds as a children’s book author following the release of his patriotic, fully-illustrated hardback, Proud To Be An American, over the Memorial Day weekend. Debuting at No. 1 on the “Movers and Shakers” chart and named one of Amazon’s top “Hot New Releases,” the book comes in as the No. 1 best-seller on both Amazon’s “Children’s Books On The U.S.” and “Children’s Multicultural Story Books” charts. Greenwood penned the new book, Proud To Be An American, in the words of his iconic anthem, “God Bless The U.S.A.,” with the hope of instilling American patriotism in the hearts of our nation’s youth. Along with the lyrics and a free download for a never-before-heard rerecord of “God Bless The U.S.A,” Proud To Be An American features colorful illustrations by Amanda Sekulow that paint the portrait of scenic farmland and cityscapes throughout the country, American soldiers, and even Arlington Cemetery. “The illustrations in my book paint in a childlike way, a picture of this country in colorful snapshots that teach geography, pinpoints the cities that they soon will know and visit, and show on several pages the servicemen and women that we honor,” Greenwood added. As a father, Greenwood recalls reading to his own children when they were very small — watching as they fervidly flipped through the pages and became captivated by all of the vivid photos and drawings. Released by Clovercroft Publishing, Proud To Be An American is currently available for purchase online at LeeGreenwood.com, Amazon and in various bookstores nationwide including Barnes and Noble, Books-A-Million, Christian Family Stores and others. After a national TV appearance last night on Hannity on FOX News, (in case you missed it, watch here), Greenwood is slated to appear at Book Expo America trade show in New York City this week and will commence his national tour performing at fairs, festivals, casinos and theaters immediately following. Tune in on July 3 to watch him perform LIVE as part of the FOX and Friends All-American Summer Concert Series kicking off Fourth of July weekend. For a full list of upcoming tour dates and additional information on Lee Greenwood, please visit www.leegreenwood.com.